LOOKING FOR AN IDEAL AND SECURED PLACE TO HOLD AN EVENT, FUNCTION, WAREHOUSING OR PARKING SPACE? 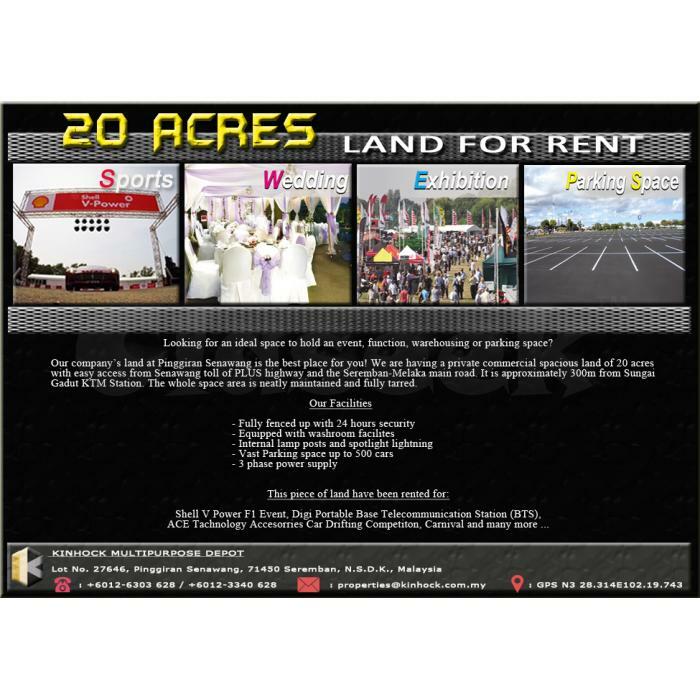 · A PRIVATE COMMERCIAL SPACIOUS LAND OF 20 ACRES WITH EASY ACCESS FROM BOTH THE SENAWANG TOLL OF THE PLUS HIGHWAY AND THE SEREMBAN-MELAKA MAIN ROAD. · IT IS APPROXIMATELY 300 METERS FROM THE SUNGAI GADUT KTM STATION. · THE WHOLE SPACE AREA IS NEATLY MAINTAINEDAND FULLY TARRED. 1. THE LAND SPACE IS FULLY FENCED UP AND WITH 24 HOURS SECURITY. 5. VAST PARKING SPACE UP TO 500 CARS. Please do not hesitate to contact us for more information! !